Meanwhile, place chicken on microwave-safe plate. Microwave on HIGH for 1 1/2 to 2 1/2 minutes or until thawed. Melt margarine in large saucepan over medium-low heat. Add flour; stir until well blended. Gradually stir in broth and milk, cooking and stirring until bubbly and thickened. Add chicken and all remaining ingredients; mix well. Simmer 5 minutes or until thoroughly heated. Split warm biscuits; place bottom half of each on individual serving plate. Spoon hot chicken mixture over each biscuit half. 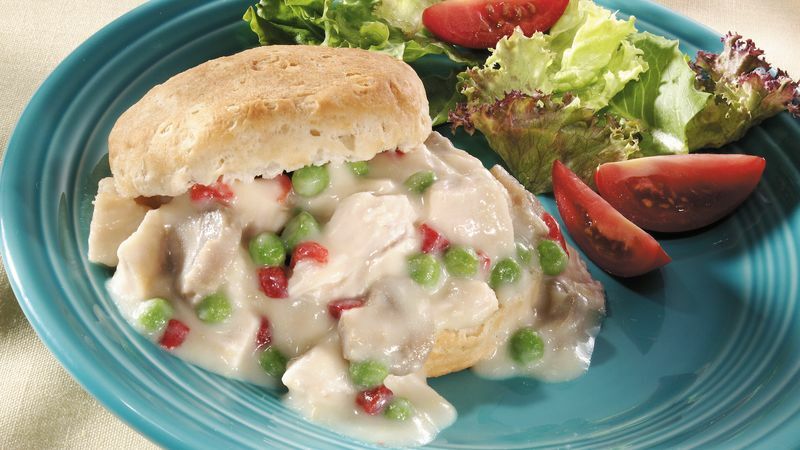 Place top biscuit halves over chicken mixture.